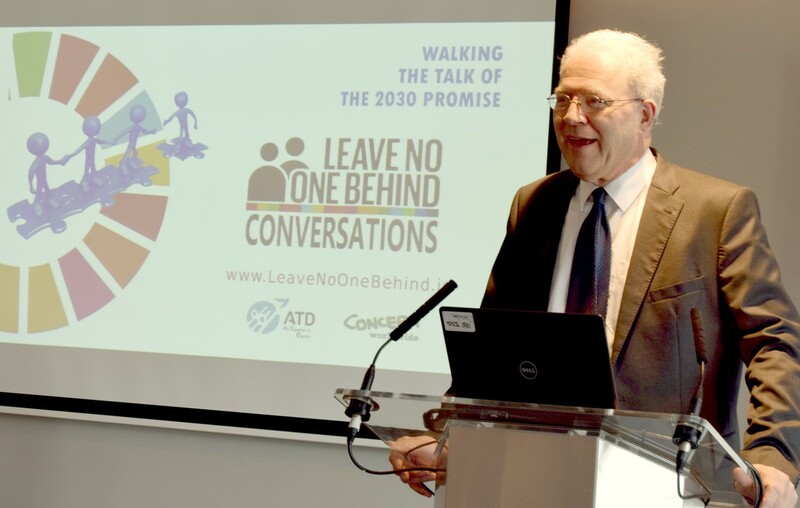 As the Leave No One Behind Patron, David Donoghue formally launched the initiative at the National Conference for the Sustainable Development Goals, Human Development and Inequalities in Croke Park on the 17th of April. Considering the array of airline troubles, including cancellations and diversions, encountered in making his way over from America, we are particularly grateful to David for persevering and making it to the event for the launch. “I am launching the Leave No One Behind initiative which ATD have been developing. Let me just say, by way of brief introduction, that this has become emblematic of the entire 2030 Agenda – the phrase “leave no one behind” and to endeavor to “reach the furthest behind first”. Those phrases really crystallised the overriding goal of poverty eradication and tackling inequality. Those phrases really bring the ideas together. In that sense, they act as a symbol for the entire agenda. What lies behind this phrase was a concern that the 2030 Agenda should address poverty eradication but in a very comprehensive, integrated way. 193 member states of the UN have formally made this commitment that they will Leave No One Behind. Leaving Nobody Behind, I regard as a top priority in relation to implementation of the SDGs because the world leaders have taken on a commitment that they will, in effect, give this set of issues top priority and that, to my mind, means taking preemptive action in the first few years of the Agenda which would enable them to demonstrate that they are actually addressing the needs of the furthest behind first. With that term, we mean of course, the poorest, the most disadvantaged, the most marginalised communities worldwide. The challenge is to get governments, as they begin to implement the agenda, to show that they are taking that particular part of it seriously.